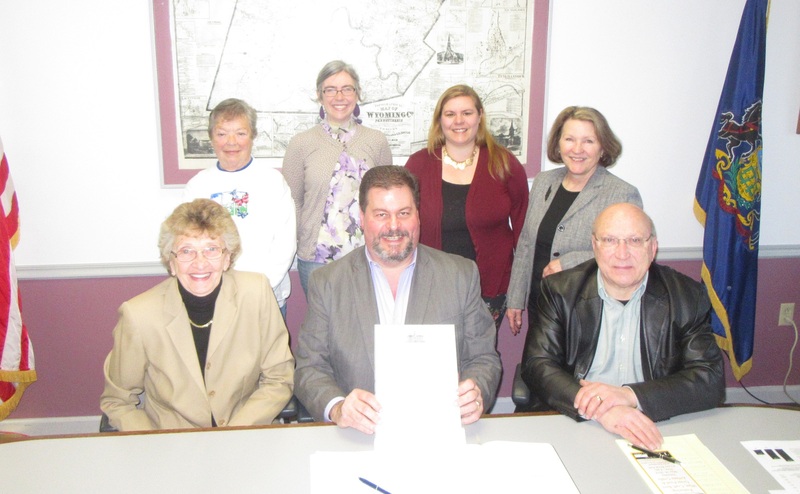 Wyoming County commissioners (seated, from left) Judy Mead, Tom Henry and Mike Stabinsky proclaimed April 7 to 13 as National Library Week in Wyoming County in the presence of (standing) Tunkhannock Public Library director Kristen Smith-Gary, Noxen Library director Charlotte Hopher, Mehoopany Library trustee Alyssa Romanuski, and new Laceyville Library director Tiffany Kuhn. Though there was no particularly pressing matter on Tuesday’s agenda for the regular meeting of the Wyoming County Commissioners, numerous topics were discussed in a short amount of time. Among them were the recent 100th birthday of a former deputy sheriff, a prestigious honor bestowed on the county’s chief detective, the need to get young adults involved in both drug awareness programs and county government, proposed minimum wage changes, and whether or not the Pennsylvania Game Commission should start antlered deer season two days earlier this year. The latter was first brought up at the March 19 meeting, when commissioner Tom Henry solicited opinions from those in the audience. Feelings were mixed on the subject, but commissioner Mike Stabinsky said at that time that he favored maintaining the first Monday after Thanksgiving as the beginning of buck season as a matter of family tradition. Since then, all three commissioners had attended the Spring CCAP (County Commissioners Association of Pennsylvania) Conference, where the general consensus was that the deer season dates should remain unchanged. “It kind of has become a state holiday,” commissioner Judy Mead remarked, suggesting also that local retailers and eateries had more to gain from keeping the traditional start date than they would by having hunters from outside the area arrive on Black Friday. Mead also recommended that a certificate of appreciation be drafted for Deacon Ray Pieretti of St. Mary’s of the Lake who informed Wyoming County Prison warden Ken Repsher that he would be resigning from his religious services position at the facility. Pieretti was a well-received volunteer at the jail, whom Henry said will be greatly missed. “His personality was wonderful for that,” Mead concurred. The commissioners recently attended an early birthday celebration at Shadowbrook Resort for Jean Wynd DeWolfe, a former Wyoming County sheriff’s deputy and the county’s first domestic relations officer. DeWolfe, who resides at Methodist Manor in Tunkhannock, will turn 100 years old on April 4, which the commissioners declared Jean DeWolfe Day. Audience member Sandra Ritz, who also attended the event, noted that DeWolfe was also a USO girl during World War II. Mead reported that county detective David Ide had recently received a Lifetime of Service Award from the Pennsylvania Department of Justice. Henry had invited Ide to attend the meeting for the announcement, but remarked that Ide is too humble to seek public notoriety. First-time meeting attendee Daniel Greenip, who attends Keystone College and is serving an internship at the Wyoming County Special Needs Association, posed a series of questions to the commissioners, wondering how to get more people in the 20- to 35-year-old age bracket involved with the fight against addiction and drug overdoses and local government. As a 23-year-old, Greenip confessed that those of his generation don’t seem to be interested in any activity that doesn’t produce an automatic monetary return. “We haven’t stepped up because we’re lazy,” Greenip stated. Despite that, he noted, his generation is losing more people every year to the opioid epidemic. He is aware that there are organizations and programs to address the situation, but suggested that the boards of such always seem to be composed of much older adults. “Coming to meetings like you are this morning is a great first step,” Henry told Greenip. Henry also said that the opening of more facilities like Endless Mountains Extended Care for adults with substance use disorders could provide more good-paying jobs for people who want to get involved with the addiction crisis. In the meantime, Mead remarked, “Maybe we need 20-somethings to expand these boards,” referring to the Luzerne-Wyoming Counties Drug & Alcohol Board and the H.O.P.E. Coalition. Regular meeting attendee Jeffry Zimmerman asked the commissioners how familiar they were with a current proposal by the PA House of Representatives to immediately increase minimum wage pay to $12 per hour, then 50 cents more per year until the hourly wage reaches $15. The state has not raised the minimum wage from $7.25 per hour since 2009, despite neighboring New York and Maryland being at $11.10 and $10.10, respectively. While Zimmerman is in favor of an increase, he suggested that the state does not look at the impact the hike could have on individual counties. Thirty-five percent of Wyoming County households are trying to survive on minimum wage, he stated, while the price of almost every commodity and service has increased since 2009. “Don’t you think that raising the minimum wage will just make everything go up again?” Mead asked Zimmerman. “A little bit,” Zimmerman agreed, but increased earnings would result in less people on public assistance, he added, the savings of which could be put into other programs. Lori Bennett, director of unlicensed programs at Wyoming County Special Needs, said that an immediate increase of more than four dollars per hour would be crippling to small businesses and non-profit organizations, the staffs of which are made up mostly of minimum wage employees. Managers at the same places are lucky to make $12 per hour, and they would all naturally expect proportionate raises. There would be no choice, she suggested, but for mom-and-pop businesses and small agencies to lay off large numbers of people, which would not aid the economy. “It’s a weird battle,” commissioner Mead remarked, agreeing that such a significant hike would likely be too much for smaller counties to bare.